Mary Jo Durand, known to her friends as MJ, earned her Bachelor of Fine Arts at Ithaca College and her Master of Arts at Penn State University. 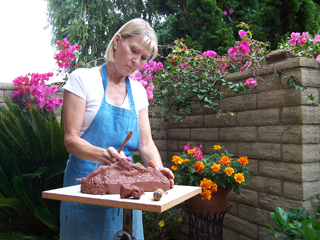 Art classes continued in California at the Brentwood Art Center in Santa Monica, California, and Santa Monica College. Her work can be seen in her hometown of Erie, Pennsylvania, and in the Antoine Pierre Salon on Montana Avenue in Santa Monica, California on a rotating basis. Please contact Mary Jo for more information on sizes, mediums, and prices via email.